In a losing side, Tom Rockliff was outstanding for the Lions finishing with 45 disposals, his equalsecond best haul and seventh time in his career that he has amassed over 40 disposals. He also had 19 contested possessions, 11 clearances and 14 tackles. Hawthorn scored 14.4.88 from opposition turnovers, its third best result from this score source this season. The Hawks have outscored the Lions by 72 points from this score source, its second best differential for the season. Hawthorn is ranked second in the AFL for kicking efficiency, going at 68 per cent by foot for the season. Today, in blustery conditions, the Hawks have gone at an impressive 73 per cent by foot, well ahead of the Lions 59 per cent. Hawthorn has 11 individual goal kickers for the match, the sixth time this season that they have recorded at least 11 goal kickers. The Hawks average nine goal kickers per game, ranked No.1 in the competition. Hawthorn have now outscored Brisbane 11.1.67 to 2.6.18 from turnovers with 10.0.60 of these turnovers originating from the midfield. Despite Brisbane's territorial dominance to end the the quarter, Hawthorn still outscored the Lions 4.1.25 to 3.2.20 for the quarter. Contested possession was 33 apiece for the quarter, with the Lions leading clearances 13 to eight. The Lions have finished the quarter strongly, recording the last 10 inside 50s of the match, while enjoying a remarkable 92 per cent time in forward half over the last 10 minutes of the quarter. Hawthorn is well on top in uncontested possession, leading 212 to 149 despite the best efforts of Tom Rockliff who leads all comers with 20 uncontested possessions for the Lions. One area that Brisbane has been well on top in has been the clearances. They lead this area 37 to 26, although the Hawks have narrowly outscored the Lions 4.4.28 to 4.2.26 from this score source. Hawthorn is kicking at an efficiency of 73 per cent of the match compared to Brisbane's 54 per cent. After trailing contested possession 32 to 40 at quarter time, the Hawks now lead contested possession 90 to 86 for the match. Hawthorn has now kicked 14 of the last 15 goals of the match with nine of these goals coming from Brisbane turnovers in the midfield. 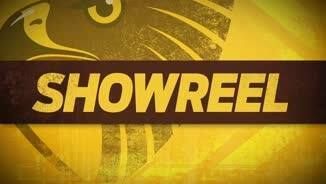 Hawthorn has kicked 3.0.18 from centre bounce clearances today. The Hawks are ranked fourth in the competition for scores from centre bounce clearances, averaging 12 points per game from this score source. Hawthorn has picked up with where it left off in the second quarter with three goals from the first three inside 50s of the quarter, two from turnovers and the other from a centre bounce clearance. The Hawks kicked 6.0.36 for the quarter from Brisbane turnovers with all six of these goals being launched from the attacking midfield zone. Hawthorn has outscored Brisbane 7.1.43 to 1.4.10 from turnovers. Liam Shiels was prolific in the second term, recording 11 disposals, eight via a contested possession and kicking one goal. The Hawks were dominant in almost every area in the second term. They recorded a kicking efficiency of 74 per cent compared to the Lions' 43 per cent, had 19 inside 50s to nine and won contested possession 38 to 32, kicking 10.1.61 to 1.4.10. 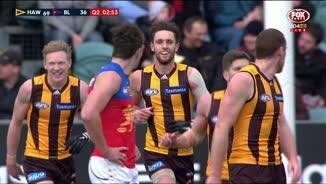 Hawthorn's previous best quarter this season was 9.3.57 against the Western Bulldogs. Coincidentally, this also came in the second quarter in a game played at Aurora Stadium, the venue of today's game. Hawthorn has kicked 10.0.60 for the quarter, its best quarter of the season and the first time that they have kicked 10 goals in a quarter since Round 7, 2014 against St.Kilda. Hawthorn are still being well beaten at the clearances, down six to 12 for the quarter, but have been efficient when they have won the clearance outscoring the Lions 3.0.18 to 0.2.2 from this score source for the quarter. The Hawks now have 11 of the last 13 inside 50s of the match, kicking 7.0.42 as a result. Four of Hawthorn's five goals this quarter have been generated from forward half chains, three from intercept possessions in the attacking midfield and one from a forward 50 stoppage. The Hawks are kicking at an efficiency of 78 per cent this quarter compared to the Lions' 43 per cent. Hawthorn have quickly got the game back on its terms with the wind this quarter. They lead inside 50s seven to three and contested possession 15 to eight, kicking 4.0.24 to 0.2.2 already this term. Both of Hawthorn's goals this quarter have come from forward half turnover chains. In fact, all three of Hawthorn's goals for the match have come as a result of intercept possessions in their attacking midfield zone. Brisbane also leads clearances 14 to 12, but have outscored the Hawks 3.0.18 to 0.2.2 from this score source, with all three goals coming from throwin clearances. At quarter time, the Lions hold the edge in contested possession 40 to 32. Brisbane has only won the contested possession count in 35 of 80 quarters this season, the equal lowest of any side in the competition. Tom Rockliff has set a new careerhigh for disposals in a quarter with 17. He has also recorded seven contested possessions, five clearances and a goal. He had previously recorded 16 disposals in a quarter on two occasions. Tom Rockliff has had an outstanding quarter thus far with 13 disposals at 77 per cent efficiency, five contested possessions, four clearances and a goal. Brisbane has already scored a goal today directly from a kickin chain. The Lions average five points per game from kick-in chains, ranked fourth in the competition. The Lions have recorded five of the last six inside 50s of the game and have enjoyed 72 per cent time in forward half in the last 10 minutes of the game. Brisbane are leading contested possession 15 to 11 at this early stage, with Hawthorn leading the tackle count 12 to five. Tom Rockliff has seven disposals already, all handballs, double that of any other player on the ground. Both teams are finding it hard in the windy conditions to use the ball effectively by foot. Hawthorn is kicking at 45 per cent efficiency, Brisbane are slightly better with the wind at 56 per cent. Brisbane has forced the secondfewest forward half turnovers of any side, generating 18 points per game from these turnovers, ranked 18th. Hawthorn has created 25 forward half turnovers per game, ranked No. 1. The Hawks have scored 37 points per game from these turnovers, ranked second. The Lions have lost the time in forward half differential by 7:16 per game this season, ranked 17th. Last week, the Hawks lost the time in forward half differential by 40 seconds against the Power, their second worst result in any game this season. Hawthorn has retained possession from 47 per cent of kicks into the forward 50. the highest percentage of any side. Brisbane has retained possession from 39 per cent of kicks into the forward 50 this season, ranked 17th. Welcome to Aurora Stadium for the Hawthorn v Brisbane Lions Round 22 clash. Don't forget to enter your tips for this match, you have until the bounce to make your selection. 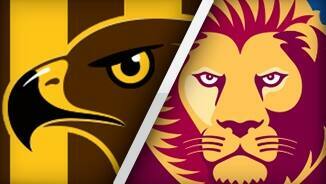 Tippers choice is currently Hawks 98.4% and Lions 1.6%. 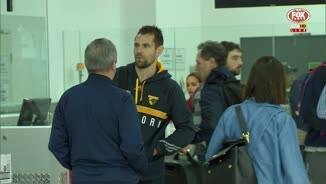 FOUR goals to Jack Gunston in his 100th game have helped premiers Hawthorn to a 72-point drubbing of the Brisbane Lions on Saturday. The 21.8 (134) to 9.8 (62) victory was set up by a 10-goal second quarter, which took the Hawks to the main break with a 34-point lead at Launceston's Aurora Stadium. Gunston was valuable in attack throughout the free-flowing game and found good support. Along with standout efforts from ever-reliable forward Jarryd Roughead, who finished with three goals and 30 disposals, and Liam Shiels (34 disposals), the Hawks didn't suffer from the absence of skipper Luke Hodge (suspension) and Sam Mitchell (illness). The victory keeps Hawthorn in third place on the ladder, while the Lions remain rooted to the bottom with one match remaining. It was a quick-fire start for the Hawks with Matthew Suckling kicking a goal in the opening 30 seconds on the first play of the day. But the Lions appeared determined not to let the favourites run away early and quickly replied. 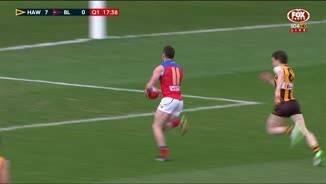 Pearce Hanley was on the end of a nice chain of possessions for the Lions, and more goals came from Luke McGuane, Jed Adcock and skipper Tom Rockliff. The Hawks seemed stifled and the Lions went to the first break 15 points ahead. 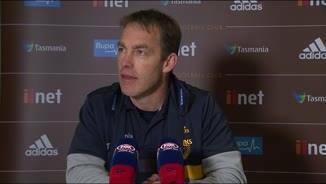 “We managed to restrict the Brisbane side to only nine inside 50s in that first quarter against that really stiff breeze, and we were pleased with that, but when they did get it in there they scored a little bit too easily for what we would have liked,” coach Alastair Clarkson said of the Hawks’ slow start to the game. Indeed it was to be a short-lived lead for the Lions, with the Hawks’ 10 goals including an impressive Isaac Smith bomb from outside 50. After displaying early confidence, the Lions lost their rhythm, giving away possession through repeated errors as Hawthorn dominated. 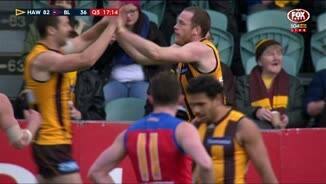 The Hawks shared the spoils with 12 players kicking goals, including James Frawley who finished with three. 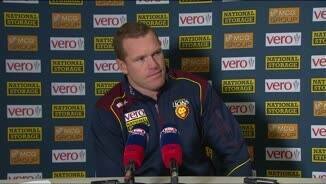 “We like to have the flexibility of Frawley being able to swing from one end of the ground to the other,” Clarkson said. For the Lions, skipper Rockliff was the standout, with a first-quarter goal alongside 45 disposals earning praise from coach Justin Leppitsch. Stefan Martin had 40 hit-outs while McGuane and Adcock finished with two goals each.